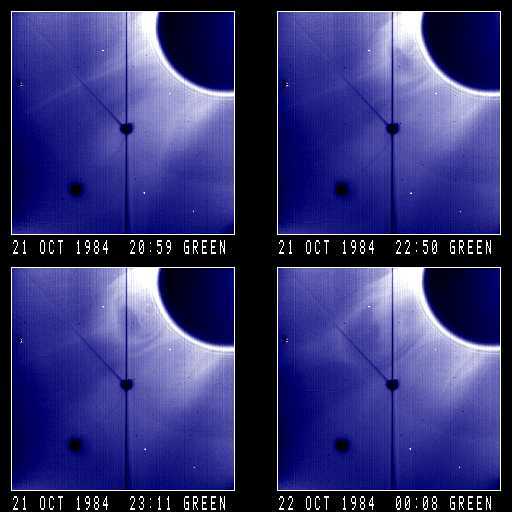 These four images, taken by the SMM Coronagraph, show a loop/cavity and core being ejected over the northeast limb of the sun. Solar north is to the upper left in each image, and the east equator points toward the lower left corner in each image. Loop/Cavity and core superposed on streamer. Defletions. Streamer is disrupted. The SMM image at 22:50 is a partial image. The remaining bottom 1/3 of the data was lost during ground transmission.